Shop Sony MDR7506 Professional Stereo Headphones from AMS with 0% Interest Payment Plans and Free Shipping. Sony MDR7506 Professional Stereo Headphones are ideal for sound monitoring in recording studios, radio, film production, video, electronic news gathering - and virtually any application where high quality sound is required. The closed-ear design MDR-7506 is outrageously popular in pro and home recording studios. It features a rugged design, convenient folding construction, 40mm driver units, gold connectors and a professional-quality OFC (oxygen free copper) cord. Sony 7500 Series headphones offer a practical range of choices for everyone from the casual user to the studio pro. These include the MDR-7506 which is lauded by many professional studios and broadcasters. 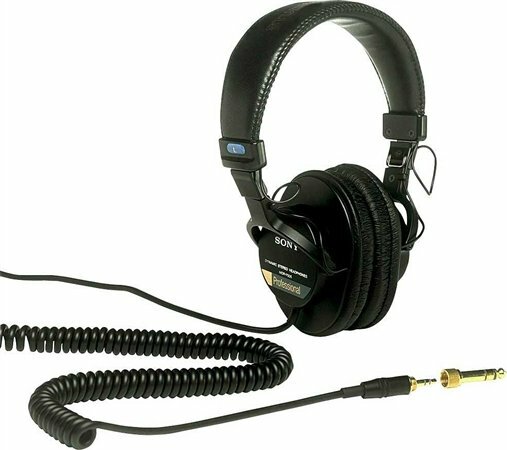 These headphones are great for mixing for frequencies in the 100hz-20000hz. Hard to definitively mix lower frequencies under 80hz. Refer to studio monitors or another source for mixing bass or 808. There’s no bass in this headphone, sounds as if you have two tweeters on your ear. I’ve used these headphones for many years & I absolutely love them! This brand speaks for it self (Sony). Love the pure quality sound this headsets gives especially for studio sound. Light in weight and fits comfortable, It's worth the money. May look flimzy but the sound in delivers for your money....4 sure! Great quality. You can't go wrong. Highly recommend. I absolutely love the 7506! To me it gives a real and true representation of what a song really sounds like, without the artificial manipulated low end frequencies. Now I only use these for mixing and mastering in my laptop. If I’m mixing in a room then that’s something else. If you’re mixing on the go you simply can’t go wrong with this headphone, but if you’re looking for bottom heavy full sound this isn’t the headphone I’d buy. This is a flatter sounding headphone. I’d say this is the NS10 of headphones. Put these on and disappear into your own little world. I'd pay 5 times as much as these cost. They will transport you into sonic heaven no matter what genre of music you make. Great product but the wires going into the earpiece moves which will allow them to get snagged and get pulled out.